There are manufacturer guidelines in place that tell us when our vehicles require certain maintenance. Most of us know the common ones, like when we’re supposed to change our oil or our tires need rotated. After all, this is how we maintain our cars’ optimal functioning on the roads of Avon, Indianapolis, and Plainfield. However, there are some maintenance requests that your car will personally bring to your attention. If you’ve recently noticed one of the dashboard lights showing up in your Toyota Corolla, your vehicle is telling you something. With this helpful guide, you’ll be better able to understand what it’s trying to say. At Andy Mohr Toyota, we can help you turn them back off for good! Ours cars come with dozens of different lights, some of which are warnings, and some of which are indicators. The warnings are meant to let us know if something in our vehicles isn’t working properly, while the indicators are simply there to tell us that a specific system is active. 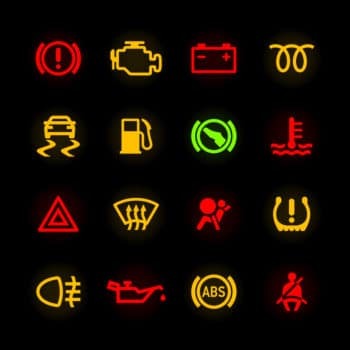 If you see one of these lights show up on your dash, we’re here to help you figure out what it means and what you can do to fix it! Low Engine Oil Pressure Warning: If you see this light, it will look like a small oil can with a drip coming out of the tip. It’s pretty self-explanatory: Your oil pressure is too low, thus indicating that you’re in need of more oil. Check your oil level, add a quart, and check again. If this light doesn’t go out, bring it in, as you might have a leak. Charging System Warning Light: This light looks like a small rectangle with a plus and minus sign inside, and it’s indicative of a malfunction with your battery. While your vehicle may let you use jumper cables to revive it initially, you’ll want to get it into our shop to be fixed permanently. Schedule an appointment for service at any time! Tire Pressure Warning Light: If you see an unclosed circle with an exclamation point inside, it’s telling you that one of your tires is not inflated to the proper tire pressure as dictated by the manufacturer. Check the desired pressure, and head to an air pump to correct the issue. If the light comes back on right away, schedule an appointment for tire service. ABS Warning Light: If the letters ABS pop up on your dash, it means that something has gone wrong with your Anti-lock Brake System or Brake Assist system. As both systems are integral to your braking abilities, your car should be seen by a professional soon, as there’s a chance you may need to replace or repair your brakes. Low Fuel Level Warning Light: If you see a small gas pump pop up on your dashboard, you’re likely close to running out of gas. While you have some time to get your vehicle filled up, you’ll want to pay close attention to where you can find your next gas station. If you’ve recently seen one of these or any other lights on your dash, it may be time to bring your car in and get it checked out. Conveniently located near the Avon, Indianapolis, and Plainfield areas, our on-site service center can help you address all the lights on your dash, whether it’s the simplest repair or something more complicated. At Andy Mohr Toyota, our team of service professionals will have your car in top shape in no time!